Eun-Jin Chae was surrounded by music as long as she can remember. If her mother was not playing the piano, then classical music was playing in the background in her home. At the age of 6, she started taking piano lessons from her mother, Kyung Sook Chae. Eun-Jin realized through taking the piano lessons that she had perfect pitch. She learned how to read music as well as how to practice and aim for perfection. When she was 8 years old living in New York City, she wanted to pursue being a violinist when she saw children around her age playing the violin at pre-college division of Juilliard. She had to beg her parents for violin lessons because they were skeptical whether or not she would continue to take lessons. To show her parents that she was committed to learning the violin, she practiced 1-2 hours daily. She also wanted to excel and be able to compete against children that had started at a young age and continued to develop their talents. She attended School for Strings in NYC until her family moved to McLean, Virginia in Fairfax County. 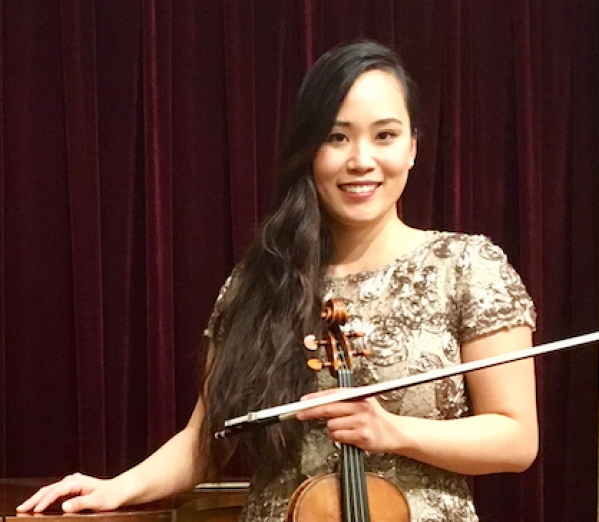 In 6th grade, Eun-Jin joined an elementary strings class in Fairfax County, Northern Virginia, and Ms. Gardner regarded her as a “child prodigy.” At this time, Eun-Jin started to practice about 2-3 hours every day. In the summers, she attended Suzuki Summers Institute for violin and an hour of piano practice was mandatory under her mother’s instruction. During the school year, she studied with Kyung Sook Chae, Ronda Cole, and John Kendall. While studying under Kyung Sook Chae, Eun-Jin placed in multiple state and local level competitions during her high school years with violin. She has performed Bruch Violin Concerto No. 1 accompanied by the Landon Symponette Orchestra in 2003. She also took a few lessons from Jenny Oaks Baker and David Salness in preparation for her violin audition for the pre-college division of Manhattan School of Music. In 2003, she started attending Manhattan School of Music (MSM) precollege division in New York City on scholarship. She was placed in the Philharmonic Orchestra, the best orchestra in MSM. She studied under Byung-Kook Kwak, Jonathan Strasser, and Krzysztof Kuznik. On Saturdays, she remembers playing the violin as long as 7-10 hours because of her lesson, chamber music, and orchestra classes in addition to her own practice. In the same year, she shared her love for music by teaching violin to students ranging from age 3 to adult in Tenafly, New Jersey in Bergen County. In 2005, she decided that she wanted to explore the world outside of music and attended Brigham Young University in Provo, Utah majoring in Social Work with minors in Ballroom Dance and Business Management. Before she attended BYU, she had never danced ballroom in her life. She credits her acceleration in learning how to dance to the values of hard work and principles of discipline she learned through years of violin training.